There’s no question: Double-parking in San Francisco is rampant, and it routinely causes danger for people on bicycles and delays for Muni riders. Just a day after Supervisor Scott Wiener held a hearing on the issue at City Hall at the beginning of the week, a Muni bus driver and car driver collided on Mission at 20th Street as the bus driver passed a double-parked car. The driver who was hit reportedly pulled out of a parking spot in front of the bus. Three Muni riders were hospitalized, and the crash caused major delays on one of the city’s busiest transit corridors. A study cited by Ricardo Olea, an SFMTA traffic engineer, found that for each block of Mission with at least one double-parked vehicle on it, Muni buses lose about eight seconds. He also noted that since double-parked cars aren’t typically included in traffic collision reports, it’s unclear how often they lead to crashes. But while there’s little data to paint a full picture of the problem, anyone who regularly navigates San Francisco streets can tell you that double-parked cars impeding traffic lanes and bike lanes are ubiquitous. 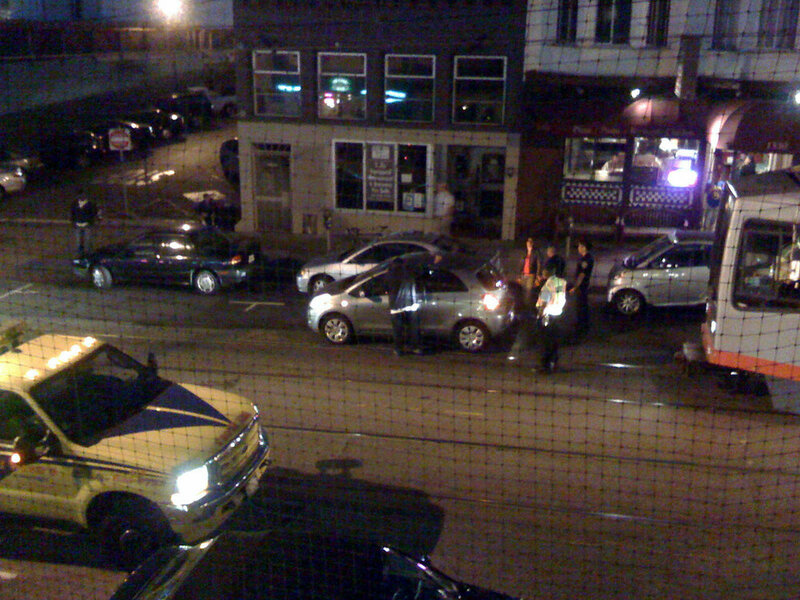 When I watched a car sit in the Folsom bike lane in the Mission last summer, the driver didn’t leave until 20 minutes after I arrived, and even then he only left after the parking control officer I called in showed up to ticket him. His double-parking forced dozens of bicycle commuters to merge into a lane with motor traffic. Last Friday evening, I watched a train on the N-Judah — Muni’s busiest line — sit helplessly behind a car left on the tracks on Ninth Avenue as the operator honked to get the driver to move. It’s a scene that repeats itself regularly in my neighborhood. Parking enforcement is primarily the job of the SFMTA’s PCOs, though police also have the authority to cite violators. Officials from those departments say enforcement seems so abysmal because PCOs are short-staffed, they’re busy citing other violations, and they often just decide not to ticket double-parked vehicles. Wiener says the problem of lax enforcement is unacceptable. Along the entire length of the Castro/Divisadero Street corridor, where double-parking is a common sight, he noted that only one ticket for double-parking is issued on an average day. “If people have an absolute minimal fear that they’re ever going to get a ticket, they’re not going to care and they’re going to double-park,” Wiener said. The lenient attitude toward double-parking seems entrenched at the SFMTA and the SFPD, however. It’s common to see officers from both departments simply ignore violators, and when they do address those drivers, they often just tell them to move along, officials from both agencies admitted at the hearing. “In many instances, a citation is kind of a last resort,” said Lea Millitello, the SFMTA’s director of security, investigations, and enforcement. SFPD Traffic Company Commander Mikail Ali said that when double-parking is at its worst, police officers will often opt to use “education” rather than enforcement, as if drivers need to be reminded that they shouldn’t double-park. While Wiener said he’s never heard of anyone getting a double-parking ticket, he does regularly hear complaints from drivers who receive citations for less egregious violations, like failing to curb their wheels on streets with slight inclines. That, he said, indicates that PCOs aren’t being deployed in the most efficient way to reduce dysfunction on city streets. “Sometimes it seems to me that there’s a focus on the easy tickets as opposed to the harder-to-issue tickets for violations that are having an actual impact on traffic,” said Wiener. Cameron Samii, the SFMTA’s parking enforcement director, said PCOs are often occupied with other tasks, like enforcing time limits in residential parking permit zones. He also said it’s usually impractical for PCOs to cite double-parkers who are called in, since they’ll often leave before the officer gets there, so they generally only issue those tickets on-sight. The SFMTA has set the fine for double parking at $110, which is currently the maximum allowed by state law. When Wiener asked why there aren’t more PCOs, given that citation revenue seems likely to be enough to pay for staffing, Millitello said the lengthy hiring and training process makes it hard for the SFMTA to keep up with “attrition” as PCOs leave the job. Samii said the SFMTA expects to hire 26 new PCOs by the end of the year, replacing the officers that have left since January. The potential expansion of SFPark does promise to reduce double-parking by adjusting meter prices to keep a space open on each block. However, that will still require drivers to actually park in the open parking spaces (Wiener noted that it’s easy to spot cars double-parked near, or even next to, an open space). Of the 22,000 double-parking tickets the SFMTA issued last year, Olea said 62 percent go to delivery drivers, rather than private autos. Olea noted that the SFMTA is also trying to expand loading zones for delivery drivers, though those are also often illegally occupied by private car drivers, or too small for trucks to fit in, but that many delivery drivers still opt to double-park to save time. California Vehicle Code 22502 actually includes an exemption for commercial vehicles to double-park when “reasonably necessary to accomplish the loading or unloading of merchandise or passengers.” However, Olea said that exemption doesn’t apply on designated streets with major transit lines such as Ninth Avenue and Mission Street, and that the SFMTA has placed signs to explicitly convey that. “I hope that this double-parking attention is not a witch hunt for church services on Sundays, where because of a lack of parking, there has to be some double-parking,” he said. Read more from Monday’s hearing at City Hall from Bay City News via ABC. Wait, what? You’d rather block a fire hydrant than a driveway? That’s horrible! If i am sitting in my car for 2 minutes waiting for someone, sure. I have plenty of time to move if something were to happen requiring the hydrant. I don’t leave the car when I double park. It is much less rude. The odds of someone needing the hydrant while I am waiting vs the odds of someone using the garage are much higher. The fire station is 2 blocks away, I’ll hear them when the trucks leave. The odds of someone needing the hydrant while I am waiting vs the odds of someone using the garage are much higher. And of course, the cost of someone using the garage calling you in is borne by you, and the cost of fire truck not being able to access the hydrant is borne by the person whose home is on fire. Don’t pretend your choice is about rudeness to others, it is calculated self-interest. Read his response again; he won’t be blocking the fire hydrant b/c he’s in his car and will move immediately if that is needed. Use your noggin. Jame is doing the polite thing. 1) The grunts. They’re the ones that patrol all the parking zones, meters, and so on. Most only make the rounds and chalk the wheels about twice a day in a particular zone. Some zones are only patrolled once a day. 2) The mid-grade, the real enforcers, who hounds the tow-away zones esp. when it comes to the 4-6 towaways. They sometimes tarted watching at 3:45 for the handicapp violators too. They do their job quite enthusiastically. 3) afterhour zombies / oncalls. They’re the ones who holds the grave shift and answers callouts (need enforcement at ****). These people barely move, if at all. Personally, if there are cars that are blocking traffic, you may get faster response calling SFPD non-emergency than MTA. Anybody who endangers others by their incompetence steering around a double parked car should have their license revoked permanently. This “definite” “danger” requires more than one numskull driver to manifest. Also, during this potential inconvenience of the resident, are they supposed to double park? Circle the block indefinitely? Very weird to demonize one bad behavior and lionize another, very similar behavior. OK, so you drive 10 miles a day. How on earth is owning a car more expensive than renting a car? Owning a car does not cost more than $5 a mile. Driving a rental car 10 miles a day does cost $5 a mile, roughly. Also, there’s the cost of getting to/from the rental company and the time picking it up and dropping it off. If your time is worth, say, $30 an hour, then how much does that rental car cost? You are making a preposterous assertion. And ruining neighborhoods by being overpopulated? Isn’t that what cities are for, increasing population density? Eyes on the Street: 3 Blocks of Bus Lane on Haight — How About One More?